Revenue class metering and the built-in TOU function provide a solid background for commercial and industrial submetering applications. 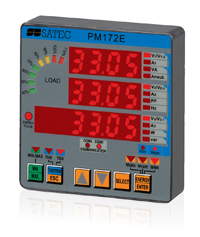 The event and data log on the basis of programmable set-points is a differentiating feature of the PM172 series. This capability facilitates a wide range of commercial and industrial applications demanding data analysis as well as corrective actions for specific recorded events. The recorded data is a valuable asset for energy management. The PM172 series is widely integrated in panel boards and SCADA systems by commercial and industrial facilities, and successfully used for electric generator applications. The PM172 series includes a choice of built-in communication platforms, such as modem, Ethernet, Profibus DP, and serial communication. The RPM075 is a non-display power meter providing a solution for cases where there is no available space for display panels. Can be connected anywhere, via panel/wall and DIN rail mounting. The RPM072 can be interfaced with Remote Display RDM172 via an RS485 communication port, or added as a second display for the PM172 series.